Court Battles are comprised of Campaigns, which include both a “defend” and “attack” phase. Your AI squad defends your court, while you play the games attacking other courts. Defending your court includes setting the custom rules, defensive lineup, attacker handicap (a restriction placed on the attacking team to make their games more challenging and aid in your defense), and a game plan for your AI squad. There will be 38 custom rules at launch, with more settings being added throughout the year. 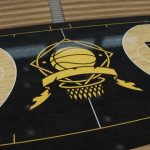 Players available for your squad are earned through The Streets World Tour, LIVE Events, and levelling up in terms of Court Hype and number of controlled courts. As mentioned, the ultimate goal is to control as many courts as possible (in addition to your own), in order to level up and earn better rewards. Bonuses are rewarded for controlling your own court, facing a more difficult opponent, and so on. Be sure to read the entire blog for the full insight! You can also watch the trailer below, or catch it here on YouTube. As always, feel free to share your opinions in the comments section below, as well as join in the discussion taking place in this topic in the NBA Live 19 section of our Forum. 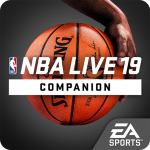 As an update to the previous bulletin, the NBA Live Companion App has now been updated for NBA Live 19. The new version of the app should be pushed through automatically for those who downloaded it last year and still have it installed. Otherwise, it’s available through Google Play and the App Store. For those who may be unfamiliar with the companion app, it is used to scan your face into the game. 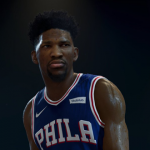 The app can be used for both the demo and the full version of the game, with the face data that you scan in for the demo carrying over to the full version of NBA Live 19, should you pick it up. Progress made in the demo will also carry over. The NBA Live 19 demo is slated for release at midnight on August 24th. If you download it, be sure to share your impressions with the community in the NLSC Forum! Also feel free to share the results of your face scans in this topic. The NBA Live 19 soundtrack has been revealed over on the game’s official website. This year’s track list includes artists such as J. Cole, Nipsey Hussle, Black Milk, and more. You can check out the full soundtrack below, as well as here over in our Wiki. 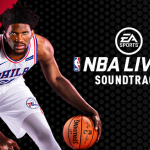 Listen to the soundtrack ahead of NBA Live 19’s release here on Spotify. Additionally, the companion app is slated for release later today. The app, which will be available for both Android and iOS devices, will allow gamers to scan their face into the game for use in The One, both in the demo and the full version. What do you think of the NBA Live 19 soundtrack? Have your say in the comments section below, and join in the discussion here in the NLSC Forum. Feel free to share your face scans once the app is released! Episode #259 of the NLSC Podcast is out now! Join Kenny, The X, and I as we discuss the past couple of weeks in basketball gaming news, which included several impressive screenshots and details on One Court customisation in NBA Live 19, a gameplay trailer and MyTEAM developer blog for NBA 2K19, and more. EA Sports has been dropping some very impressive screenshots of NBA Live 19, and revealing some player ratings. We give our thoughts on both. 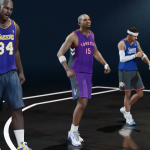 One Court customisation has been officially announced for NBA Live 19, revealing some content that is very appealing to us. 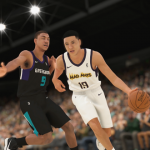 Before we get to this week’s NBA 2K19 news, we revisit the developer blog for MyLEAGUE, MyGM, and MyLEAGUE Online to share some additional thoughts. We have our first NBA 2K19 gameplay trailer, titled “Take the Crown”. Did it wow us the same way the OMG Trailer once did? 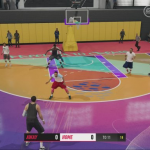 The latest developer blog for NBA 2K19 dropped a ton of information about MyTEAM. We discuss everything that we’ve gleaned from it. Naturally we’re disappointed to hear that “Creator” by Santigold isn’t on the NBA 2K19 soundtrack, but we talk about it anyway. We wrap up Episode #259 of the NLSC Podcast with a quick discussion of the unfortunate and somewhat controversial forfeit by the WNBA’s Las Vegas Aces. For NBA Live 19, we’re introducing a brand-new feature called The One Court. Your One Court sits at the center of your NBA Live experience and allows players to express themselves in a whole new way. With a full suite of customization options, users can create something truly unique. Choose a location for your court from over 1000 real cities from around the world (with more to be added). Select from a preset Theme, or individually customise all the colours of the lines, paint, and other court textures. Pick different floor materials, from hardwood to polished concrete to asphalt. Add full court designs, with a variety of options available right away. Floor paint options are also available. Logos can be placed at five different locations. There are many to choose from, including a selection of retro NBA team logos. All equipment from the basket to the ball can be customised. Your One Court can be used for drills, shootarounds, and scrimmages, as well as private online games with friends. Check out the article for more details. 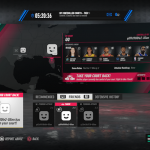 You can also find various screenshots of the customisation features below, as well as in our NBA Live 19 Screenshots gallery. There’s no word on whether the custom logos will also be available in Ultimate Team, but hopefully, that will be the case. 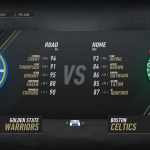 We’ll certainly post more information as it becomes available, but for now, feel free to add your thoughts in the comments below, as well as in this topic in the NBA Live 19 section of the NLSC Forum. A few more NBA Live 19 screenshots have been released over the past couple of days. The latest batch of screenshots spotlights a few members of this year’s rookie class, and it seems that the face scans that were performed during the 2018 Summer League yielded some excellent results. 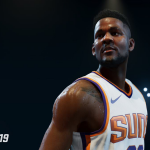 The rookies featured in the latest screenshots are first overall pick Deandre Ayton, Luka Doncic, Michael Porter Jr, Shai Gilgeous-Alexander, Collin Sexton, and Trae Young. 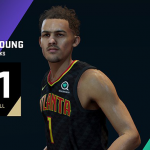 Additionally, EA Sports have posted a few ratings reveals infographics providing in-game shots of a couple of other rookies, namely Kevin Knox, and Marvin Bagley III. Aside from the rookies, there’s also a screenshot of DeMarcus Cousins that you may have already seen, but I neglected to include it in the previous bulletin. Be sure to check out all of the latest screenshots below, as well as here in our NBA Live 19 Screenshots gallery! What are your thoughts on the latest screenshots? Feel free to have your say in the comments section below, as well as join in the discussion here in the NLSC Forum. As always, feel free to share your thoughts in the comments section below, as well as in this topic in the NLSC Forum. 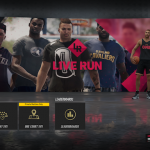 While the ratings reveals have included a couple of infographics providing a glimpse of various players as they appear in NBA Live 19, community manager Donnie G has dropped four new screenshots that give us a much better look at this year’s game. The four players featured in the new screenshots are cover player Joel Embiid, NBA Live 16 cover player Russell Westbrook, Kevin Durant, and DeMar DeRozan, who is sporting his new San Antonio Spurs jersey. For those who may have missed the earlier articles, those players are rated 92 Overall, 93 Overall, 95 Overall, and 90 Overall respectively. 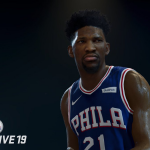 Check out the screenshots below, as well as over in our NBA Live 19 gallery. I’ve also included the infographics from the ratings reveals articles, which provide a look at a couple of other players (as well as the aforementioned ones). Feel free to share your thoughts in the comments section below, as well as here in the Forum. We’re hoping to set up some developer interviews soon, and we’ll obviously post any other news that comes along, so stay tuned for more details.